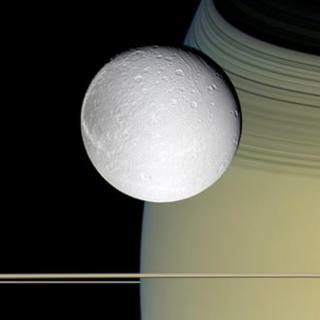 Nasa's Cassini spacecraft has spied possible signs of geological activity on Saturn's icy moon Dione. It sees features that resemble hot fissures and indications of a possible ice volcano on the satellite. The fissures look remarkably similar to the "tiger stripes" found on Saturn's moon Enceladus, which spew powerful jets of water into space. On Dione these features may now be idle, but other lines of evidence suggest some activity is ongoing. The new findings suggest this saturnian moon could be a more dynamic place than was previously supposed. Dr Bonnie J Buratti, from Nasa's Jet Propulsion Laboratory (JPL) in Pasadena, presented the results at the43rd Lunar and Planetary Science Conference (LPSC)in The Woodlands, Texas. The case for activity on Dione relies on several different lines of evidence. Previous observations of Saturn's magnetic field have picked up a stream of charged particles originating from Dione's surface. In addition, scientists announced earlier this month that they had detected a thin oxygen atmosphere around the moon. But the most obvious evidence, the JPL researcher explained, was to be found in the moon's surface features. For example, one large region in Dione's leading hemisphere is relatively free of impact craters. Either material flowed into these craters, filling them in, or they were covered over by debris from an eruption. A clue comes from the identification of an apparent cryovolcano in this flat region of Dione. Cryovolcanoes have so far been found on Enceladus, Neptune's moon Triton, and - debatably - on Saturn's moon Titan. They erupt water-ammonia or methane instead of molten rock. "We also see what I like to call a 'palaeo-tiger stripe', both on Tethys (another Saturnian moon) and Dione. It looks like a fossilised tiger stripe," Dr Buratti said. Images from Cassini also reveal the presence of "rampart craters" on Dione, which result when a space rock slams into soft material. The could suggest the ice beneath the surface is warmer than usual. During the question and answer session following Dr Buratti's talk, John Spencer from the South West Research Institute, revealed that Cassini's CIRS instrument had been searching for heat emission from the moon, but had so far failed to find any. Dr Buratti agreed that evidence of hotspots would provide a "smoking gun" in the case for geological activity on Dione. Linda Spilker, project scientist on the Cassini mission, explained that if there was any activity at Dione, it would be at a lower level than on Enceladus. "We haven't detected obvious jets, like we have at Enceladus. But we're still looking," Dr Spilker, who is also based at JPL, told BBC News. Prof William McKinnon, from Washington University in St Louis, commented: "I suspect that not a lot is going on on Dione right now." But he said things could have been different in the past, adding: "There's clearly been resurfacing... we know something happened." The discovery of geysers on Enceladus, which are supplied with liquid water by a sub-surface ocean, has been one of the science highlights of Cassini's mission. It moves around Saturn in a distorted, oval-shaped orbit rather than a circular one. This causes Enceladus to be pulled and squeezed by Saturn's gravity, inducing the heat that enables geological activity.